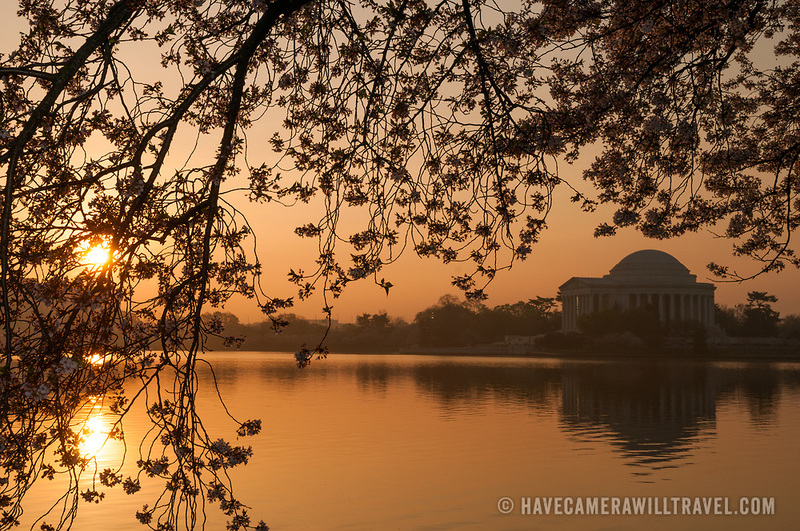 Sunrise at the Tidal Basin, with the Jefferson Memorial at right and cherry blossoms in bloom at top and left of frame. The Yoshino Cherry Blossom trees lining the Tidal Basin in Washington DC bloom each early spring. Some of the original trees from the original planting 100 years ago (in 2012) are still alive and flowering. Because of heatwave conditions extending across much of the North American continent and an unusually warm winter in the Washington DC region, the 2012 peak bloom came earlier than usual.